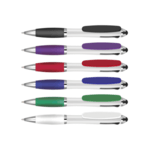 Multi-function promotional pens are a great giveaway item to use within a marketing campaign. They can add a novelty and fun element whether its for a business campaign or one aimed at the wider public. 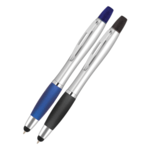 We can supply a number of different types of promotional multi-function pen including different ink colours and combination multifunction pens providing both ink and lead combinations. 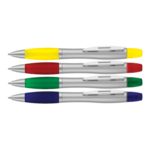 Within the educational sector promotional multifunction pens are ideal as teachers, lecturers and students can use the different coloured inks for marking up their work essays, tests and exams. 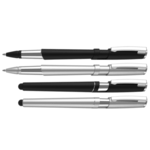 Are multi function pens more expensive than a typical plastic pen? 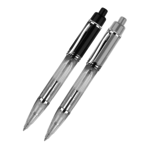 The pens will have a slightly higher unit cost due to the extra function(s) built into-them. The best way to get the unit cost down is to order your multi function pen in a higher quality as pricing is volume related. 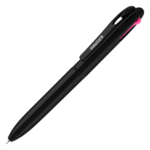 Where can you print on a multi function pen? 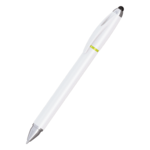 Printing is the same as for a traditional plastic or executive pen. 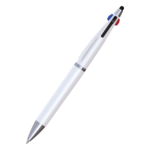 For the imprint area and options please see the individual multi function pen product specifications. The main printing area is on the barrel but we may also be able to print onto the pen top as well. 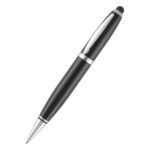 What is a multi function pen? 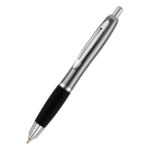 A multi function pen incorporates functions in additional to a single pen nib. 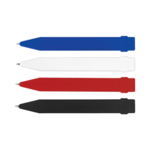 These can include more pen nibs and colours or gadgets such as a USB or magnetic strip. 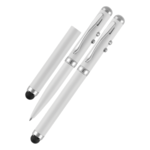 Stylus pens are a form of multi function pen but we include these in a separate Stylus Pen collection.